I have been harangued by guides wherever I've been. 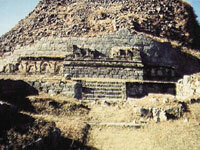 But there is a breed of guides that is exclusive to Pakistani archaeological sites that is truly remarkable. The doyen of all these works of divine art was the elderly man in the museum at Bhambore in Sindh. The minute he saw you peering through the glass at the artefacts within the cases, he went into a frenzy. He was the son of the King Ameer Shere Ali, who ruled Afghanistan from 1863-1878. Ayub Khan was born in 1855 and spent most of his early life in Afghanistan. His brother Yakub Khan ascended the throne after his father's demise and Ayub Khan became the governor of Herat. The term 'Great Game' was popularised during the British Empire's conflict with Tsarist Russian Empire in the 19th century. Afghanistan and its monarchs became pawns in this imperial game of rivalry and strategic influence and its outcome was to have a direct bearing on the British Empire's hold over India. Soon after their arrival, the British deposed Ayub's brother Yakub Khan and then a long campaign ensued. The battle at Maiwand was fought on July 27, 1880 when Ayub Khan successfully led 6000 men and intercepted the British army at this place in order to thwart their invasion of Afghanistan. The terrible heat of the Afghan summer that year and other logistic difficulties greatly disadvantaged the 66th (Berkshire) Regiment led by General Burrows in its advance and was annihilated by the Afghans who tore through all its lines. The victory is often cited as being perhaps the only instance where an Asiatic leader won a pitched battle fought against a vastly superior European army. Sardar Muhammad Ayub Khan is revered as a freedom fighter and national hero in Afghanistan. Many 19th century poets have composed ballads about the 'Ghazi of Maiwand' and glorified him for giving the foreign invaders a bloody nose. There is a monument of the battle of Maiwand in Afghanistan. The tower, known as Minar-e-Maiwand was erected by King Zahir Shah in 1959 in the town square. A Pashto inscription, taken from a poem, relates a legend how at one stage the Afghans were preparing for retreat when a young woman named Malalai, stepped forward and pleaded to them: "If you do not taste of martyrdom today on this field of Maiwand, by God I am afraid you'll lead an ignominious life forever." It is recounted, upon hearing this the men turned back to win the battle. The unprecedented British defeat caused a sensation in Europe and provided much literary food for English writers such as Rudyard Kipling who composed a poem entitled 'That Day'. Sir Arthur Conan Doyle's fictional character Watson is actually based on a surgeon of the 66th Regiment. In 'A Study in Scarlet' (1881), Watson describes how he got shot whilst attending to a fallen soldier at Maiwand. "How are you? You have been to Afghanistan, I perceive" are the opening words spoken by Sherlock Holmes to Dr. Watson. "How on earth did you know that? ", Watson asks in admiration. It is the first of many displays of Holmes's brilliant deductive abilities. Ayub Khan's victory was short-lived as another army under the direction of Field Marshall Frederick Roberts came in his pursuit after a few months. And when the British army drew back into India leaving the Afghans to govern themselves, Ayub's cousin and staunch enemy Abdur Rahman Khan proclaimed himself Ameer routing Ayub's supporters. Ayub Khan was forced to flee to Herat and later sought refuge in Persia where he spent many years in exile. The new King Ameer Abdur Rahman continued to hatch conspiracies against him and made his life difficult even there. Today, the Victor of Maiwand rests alone in his glory in a small marble mausoleum in the Durrani Graveyard near Wazir Bagh, just outside the old walled city of Peshawar. His tomb made of pure white marble is a fine example of hand craftsmanship. It has a round canopy and bears beautiful floral carvings, geometric patterns and Islamic calligraphy. The mausoleum's construction was commissioned by the government of Afghanistan during the reign of King Habibullah Khan. The gravestone carries a Persian inscription that lavishes much praise on the inmate. 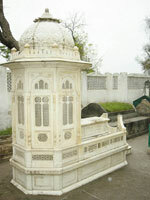 Other dignitaries buried in the Durrani Graveyard compound include his mother (wife of Ameer Shere Ali and queen of Afghanistan), Sardar Ibrahim Khan (brother), Sardar Jalaluddin Khan and other close family members. 'Luq this,' he would begin. And mind you, it was never 'look' it was always 'luq' with the guttural ending that we get from Semitic tongues. There would then follow a wild barrage of words, words, words that no living or dead mortal or even immortal could decipher. They were something like, 'Thunk, thud, bhonk, dhonk.' In this coded deluge there would be a few barely recognisable ones like Scythian, Indo-European, Sassanian or some such. Sometimes you could also make out that the automaton was delivering sounds that could perhaps belong to the English language. Mostly it was just a frenzied flood of incomprehensible verbosity. That was 30 years ago when yours truly was just an ignorant bumpkin who couldn't tell Parthian from Anglo-Saxon and who bravely (and vainly) struggled to make sense of that esoteric torrent of words. But I gave up and instead resorted to books. A whole new world opened up and I was soon equipped to tell that old automaton of frenzy to shut up and leave me alone. Shortly after that, while I was still living in Karachi, he retired from the service and I rejoiced. And then, unable to give vent to the almighty accumulation of words inside him, he died. I rejoiced some more. But much to my chagrin I learned that he had left behind a couple of clones of his. The tradition at Bhambore Museum lives on. One part of my book 'The Salt Range and the Potohar Plateau' concerned Taxila. So back in 1995 I betook myself and my bicycle there, parked me in the PTDC motel and went cycling about the several ruined sites of Taxila. I then realised that the old man of Bhambore had actually left his clones in this place as well. But having read John Marshall's opus on Taxila and carrying his much abbreviated guide book with me, I would tell the so-called guides to let me be. It took a bit of doing, but when they saw me daily poking around this ruin or that and not giving them any money for the hot air they expended, they gave up on me and left me alone. That was when I really got to know the monasteries of Dharmarajika, Mohra Moradu and Jaulian. My favourite has always been Mohra Moradu where I would spend hours reading either in the assembly hall or by the water tank. The time came when I could almost hear the gentle hum of the monks' prayers. The premium spot at Mohra Moradu, however, was always the kitchen. There right under the acacia trees that were alive with tree pies and mynas, I could have actually spent the rest of my life. And if I believed in reincarnation, I would say I was once a Buddhist monk who had volunteered to run this very refectory. But that is not the story. The point I should be making is that these so-called guides are simply semi-literate watchmen -- chowkidars, who probably glean their knowledge, or lack of it actually, from the guides who accompany some hapless foreign tour group. They then masquerade as guides to make some little money on the side. Nothing wrong there as long as they tell the tourists something sensible. So recently when my sister was visiting from Toronto we went to Taxila. Once again we parked ourselves at the PTDC motel and went walkabout in the ruins. The first stop at Bhir where Raja Paurava (Porus to you ignoramuses) would have ruled for a short while and where Alexander and his generals held their drunken revels was alright. But at Dharmarajika we were accosted by that masquerading automaton. He met us as we entered the stupa and monastery complex and let loose with his barrage of stilted Urdu. This was a good deal better than the old man of Bhambore who insisted on speaking what he called English. I told the man, in Punjabi, that I had written a book and that he could save his breath for some others. The man wasn't daunted. He followed us like a maniac unloading his torrent of words upon our unhearing ears. I told him a second time that having written a book, I had some idea of what we were looking at. But nothing. No effect. Sis turned on the man and told him he was a bloody fool and this was as much a jail as Camp X-ray was the official residence of the president of USA. For the first time in 40 odd minutes the man shut up. My motto being kick a man the hardest when he's down, I set upon him. I told him if this was the rubbish he was feeding the yahoos (let's admit it, most of us, even those who go to Taxila, are yahoos) who visited, he ought to be strung up the tree above us. Why, forced labour in a Buddhist monastery, whoever heard of that? I mean, how daft could that moron be? If I am not wrong he had earlier told us that he had been with the department for 12 years. In all this time the ruins had not resolved into anything meaningful for this fool. Yet the Department of Archaeology permits him to inflict himself upon unwary visitors. I suspect he heard a real guide say something about the millstone, but failing to comprehend the true meaning, he made up the rest of the story. The yahoos who are treated to this yarn very likely go away believing that the monks were cruel people who had forced labour camps where prisoners were whipped to work the mills. And since it is Islam against the rest of the world, the story would enlarge to tell how the prisoners were always Muslims. It would not matter to a yahoo that when that millstone was used at Dharmarajika, Islam was still some centuries in the future. But, worry not, our tirade would have left no mark on the man and he would be ready to inflict his knowledge on the next bunch of tourists. So, the next time you find yourself poking about the ruins of Taxila, be mindful of the tales told by the man posing as a guide.